A senior nurse in my hospital retired from service recently. I have known her since the infancy of my career. A gentle and loving lady, highly capable and brilliant with her patients, she was one of the most respected nurses in our Intensive Care Unit (ICU). A few months after her retirement, I bumped into a former patient of mine who was treated for a severe lung infection a few years ago. He is currently pursuing a degree in engineering. Over a cup of coffee, he asked if I knew where the nurse who took care of him was staying. He had been to the hospital and was told of her retirement. Naturally, I was curious to know why he wanted to meet her after so many years. His answer still resonates within me. I have always believed being in medicine is a calling. Doctors are trained to be kind, gentle and compassionate. We devote our time and energy to care for our patients, to give them a sense of orderliness, security and comfort to name but a few. I was wrong. I merely gave the orders. My nurses carried them out. And often they went beyond the call of duty for our patients. They breathe and bleed compassion and dedicate their lives for a single purpose. To care for the sick and ailing. I wrote this piece so they can be heard and appreciated. And for them to know, that I am grateful. Immensely. Physical and verbal abuses from ill and confused patients are part of the nursing routine. A young nurse once mentioned that if she gets home without a stain on her scrubs, her husband would think she did not go to work and was having an affair! I have watched nurses being slapped and kicked while they tried to restrain aggressive patients. Being spat at is common. Learning to duck while things are thrown at you is an important attribute. Patients will try to sink their teeth into someone the moment they are restrained and since the doctors only give out the orders, the nurses become the victims. Some will miraculously escape from their restraints, confounding even the likes of Houdini and lash out if anyone comes within ’striking distance’. It’s near impossible taking their vital signs, let alone feeding them. And when you’re done with one, there will always be another. Nurses are also forced to dance attendance to the patient’s relatives who demand explanation for a particular treatment administered by the doctors. They become abusive if they can’t meet the doctors and vent their frustrations on the nurses. They become condescending, rude and downright vulgar with their words. I remember a young couple reducing a nurse to tears, all for the sole reason their child was kept fasted prior to a surgery and then it was cancelled. It’s not her fault. I cancelled the surgery. And she bore the brunt of their anger. And yet very few nurses actually complain. They bear no resentment towards the doctors or their patients. They swallow the pain and their pride and continue to endure. They do it best and make it look so simple. And very few of us actually realize that. When I need any specimen from a patient, be it phlegm, saliva, pus, blood, urine or stool, I can always count on my nurses. No boil is angry enough, no discharge too foul-smelling and no feces too odious for my nurses to refuse their job. They will get it done. And while constantly being exposed to health hazards. They are my gladiators and they will wear the ’battle scars’ of their efforts albeit not too proudly on their white uniforms or scrubs till their shift is over. Confused and demented patients often confuse a space by the window for a latrine and they can choose the most inconvenient of times to empty their bowels there. And the nurses have to clean it up, while putting on hold the passing of duty to the next shift, which by the way, rarely ends as scheduled. And I have always wondered how they manage to have their meals after all the ’assaults to their senses’. Being a nurse is probably one of the most effective methods of losing weight! Now there’s the silver lining. Nurses work on a rotation basis. They can work during the morning for a few days and revert to working in the evening for a week and then a few days of night shifts before they get a day off. The timing of their shifts is such that their sleep patterns are disturbed. When they finally get the hang of a particular shift, a new one starts. They rarely take days off from work even if they fall ill because other nurses have to cover their shifts. And they will have to replace it later. Shortage of nurses further compounds this problem. Nurses have to learn to hold their bladder for a prolonged period of time, far beyond the capacity of a normal functioning human being. They learn never to give in to the excruciating pangs of hunger while being on the job. Break time is for feeding the patients and to complete their nursing report. A preterm neonate in an incubator can deteriorate within seconds the moment your back is turned. A teenager with dengue fever in shock needs constant monitoring of his fluids. An elderly man with diabetic ketoacidosis needs his insulin infusion updated so he does not go into hypoglycemia. Constant vigilance. 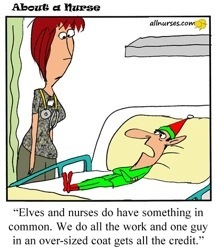 It becomes ingrained within the nurses. A deep-seated unshakeable belief. Upon graduation from medical school, interns often find themselves wandering aimlessly in the hospital corridors. Do you remember who showed you the way? Was it the consultant who was diligently preparing his case against the next legal attack a patient’s lawyer was lining up? Was it the registrar who was too busy studying for his clinical exams? Or was it the patient who made you feel like you were too young to be in the room with her? Who stood next to you when you were too afraid to draw a patient’s blood? Who answered ’he is old enough’ when a patient wanted to know your age? Who helped you insert a cannula at two in the morning when you have tried a dozen times and failed? Who gave you that pat on your back and told you ’you’ve got this’ when a patient collapsed and needed CPR? Who made you look good in front of your consultant when you did not know the correct antibiotic for meningitis and she whispered it into your ears as she walked out of the room? Who did all the dirty work in the labour room but allowed you to bring the baby to the mother? Who assisted you in your first surgery with a ’malignant’ surgeon and taught you all the tricks to survive him? Who made you the cup of coffee when you have been up for 36 hours? Who gave you their shoulders to cry when your seniors bullied you and called you ’stupid and incapable’? That’s right. It’s always been them. Unfortunately, some doctors develop selective memory loss once they have found their footing. They attribute their survival in medicine to their singular efforts alone with very little help from others especially the nurses who are now beneath them. The humble tone of their voices turn condescending. The downcast eyes become fiery. The hesitant steps move more purposeful. And their ego swells disproportionate to their actual talents. It’s the bitter truth. Fortunately, they are the select few. And yet the nurses never leave our side. It is difficult to imagine having a social life once you enter the nursing profession. It is infinitely much harder if you have a family. After her shift is over, she has to rush home and cook for her family. She has to help her children with their homework and listen to her husband complaining about her job although she pays the utility bills every month. She does the laundry and the dishes because she can’t afford a maid. She bathes the dog and feeds the cat before her head finally hits the pillow. And the next day the cycle repeats itself. Despite their sacrifices, their work requirements and timing cause a strain in their marriage and often leads to a divorce. It must hurt when they have given everything till there’s nothing left to give, only to learn it isn’t enough. There will always be dark days. But remember, it’s my turn now to be your light. Thank you for everything. Sincerely.